World Car Free Day (22 September) aims to encourage people to be less dependent on their cars and make more use of walking, cycling or public transport. Emissions from cars and other vehicles contribute to climate change by releasing carbon dioxide into the atmosphere. They also contribute to emissions of other pollutants such as carbon monoxide and nitrogen oxide, the latter contributing to smog and acid rain. To mark World Car Free Day, we’ve come up with 5 facts about cars. 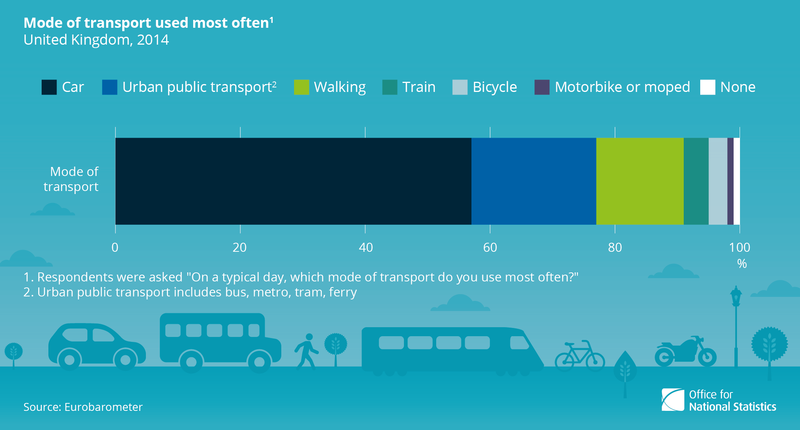 When people in the UK were asked what kind of transport they used most often on a typical day, more than half (57%) reported using a car. A fifth (20%) used urban public transport, while walking was the third most common mode of daily transport (14%). 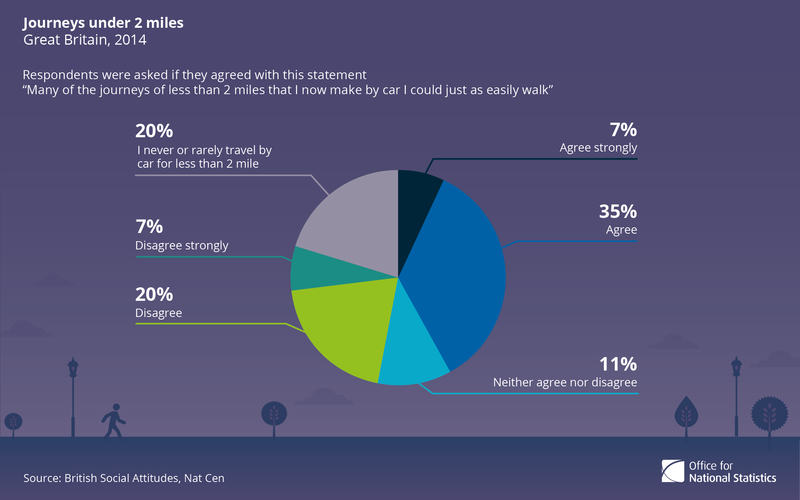 Over two-fifths (42%) of people in Great Britain in 2014 agreed with the statement: ‘Many of the journeys of less than 2 miles that I now make by car I could just as easily walk’. Making short journeys by car causes more pollutants as catalytic converters designed to reduce these pollutants do not work effectively on trips under 5 miles. 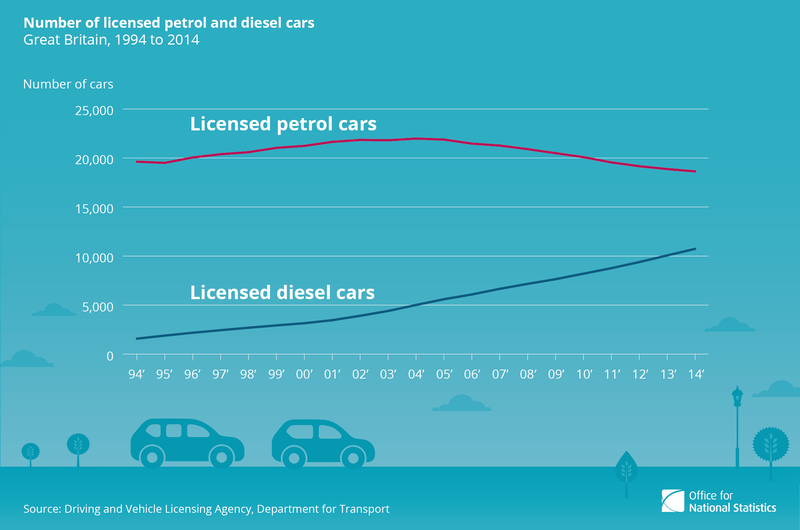 Between 1994 and 2014, the number of petrol-driven cars in Great Britain decreased by 5% while diesel cars increased by 581%. This may be due to a tax cut on diesel fuel in 2001 and a reduced vehicle tax for all cars with low carbon dioxide (CO2) emissions, which encouraged motorists to trade in their petrol cars for diesel vehicles. Over the same period in the UK, petrol consumption has decreased by 46% (11.7 million tonnes of oil equivalent) and diesel use has increased by 75% (10.7 million tonnes of oil equivalent). 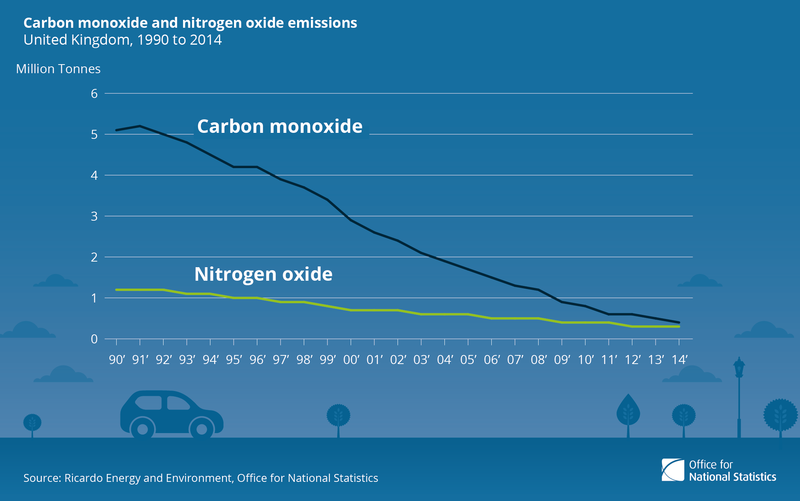 Between 1990 and 2014, the 2 major air pollutant emissions from car engines, namely carbon monoxide and nitrogen oxide have fallen by 91% and 76% respectively in the UK. This was probably due to the introduction of catalytic converters fitted to cars in the early 1990s to reduce pollutants from car exhausts. 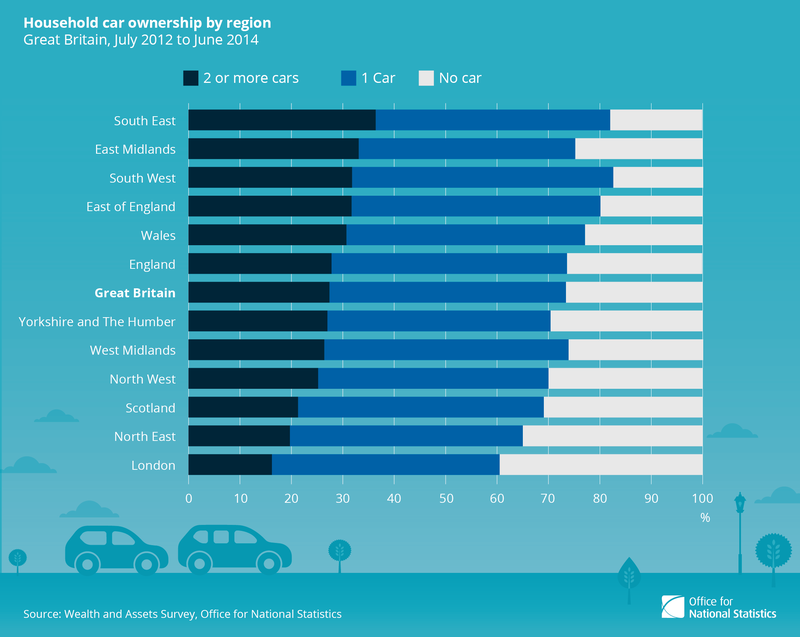 In Great Britain, between July 2012 and June 2014, almost half of households (46%) owned a car and a further 27% of households owned 2 or more cars, while 27% of households did not own a car.